Ah well, back to the drawing board... but rocket engineering is hard. They'll get right next time. Hard? Come on, it's not ... oh wait, never mind. It's another thing to engineer round. The F9 itself has redundancy in the engines, so it's now redundancy in the landing engines needed. Hopefully without adding weight and cost. Main thing is not stopping the re-use later this year. The rest, to paraphrase, will be history. Ha rocket science... it's not exactly brain surgery, is it! > Ha rocket science... it's not exactly brain surgery, is it! "it's now redundancy in the landing engines needed"
They probably need a particular configuration of three engines, but they could maybe look at the telemetry towards the end of the ascent to assess which engines are in best condition for a successful landing. "They'll get right next time." As Craig 2 noted, they have shown it can be done so the concept is sound. What is no happening is the learning phase of finding and fixing problems before the technology can be said to be fully ready. They are close but I suspect there will be a few failures before the bugs are squashed. However, even with today's failure good job Space X. Only Musk could come up with a nice way of saying it crashed and exploded. Can't fault the achievements of Space X though ! Keep going, I doubt I will ever find this boring ! I'm sure the EUTELSAT folks will be surprised that SpaceX is "taxpayer funded", considering that they paid $60 million+ for the launch of their satellites. Or does receiving government contracts for one thing mean that everything else you do is "taxpayer funded"? I believe they're only partially tax payer funded (in the sense that NASA is providing assistance in the hopes of getting to use the Falcon 9 to cut the cost of their own launches), with a large proportion of their funding coming from the launch of satellites like the geostationary one which went up in this launch. "Only Musk could come up with a nice way of saying it crashed and exploded." and a host of other euphemisms, all predating Musk by decades. This is a branch of engineering where spectacular failures are common, so gallows humour arises naturally. For the descriptively challenged, the rockets are Musk's so he has the privilege of defining nomenclature. Build yer own rocket and name anything ya wants. Except he doesn't seem to make any such attempts, he's just using traditional aerospace engineering jargon. It probably didn't even occur to Musk that someone might attribute that old joke to him. I am now using this phrase for certain events of the Friday-night-becoming-legless variety. With all that rocket fuel powering the barbecue, I think that the steak would have been rather overdone for me. Just ask Donald Trump. He has an answer for everything. I thought it was Rapid Unscheduled *Disassembly*. The video looked like the Falcon was vertical, but on fire before it cut out. It'll be interesting to see what actually happened. How much of a redesign would be required to shut down a faulty engine & fire up one of the other 6? When you're only 10 seconds from touchdown? Quite a lot of redesign! Probably pretty tricky since they'd have to account for the different position of the nozzle. From the sounds of it it wasn't a dead engine, just not producing full thrust. They're talking about making it so they can increase the thrust if this recurs. But it's just speculation on my part, I'm not even an armchair rocket scientist, let alone a real one. Given that they're in a ring of eight engines surrounding a central one (pic here), you'd probably need to shut down the faulty engine, and the one opposite it, and then light up a different pair. As for what they'd do if the central engine is faulty, I don't know. Actually, I would think that Musk's goal of boring launches is close. The landings are still exciting tho. Indeed. This "fail" for SpaceX would be a success for the other guys still struggling to get cargo into orbit. Either CrashX is asymptotically approaching successful landings, or just random ones. This could go on for years before shareholders catch on. SpaceX is still learning, and coming back from GEO was always going to be much harder than LEO. Any fule kno that. Successful landing was hoped for, but I don't believe it was expected. This is just an engineering problem to work around. And they still manage to launch for way less cost than the encumbents. To be fair this wasn't from orbit - far too slow for that. Fair point, I missed that little nuance. Have an internet. Remind me of what SpaceX is planning on doing with their landed vehicles. I am waiting for them to learn they can't fly the junk again. The crashes seem to come from new issues rather than existing ones, so they're gradually improving their functionality. At the same time this was a successful commercial launch of the geostationary satellite mentioned, which means they still get paid. SpaceX isn't publicly traded, so they don't have any shareholders. Being a private company doesn't preclude the existence of shareholders. In SpaceX's case, its shares are held by management, employees, and the venture capital groups that helped launch (har) the company. Those SpaceX shares not available on the usual public markets but you can find them in secondary markets where former employees sell them. Note that the company retains right of first refusal on stock sales, so you might set everything up only to see SpaceX block the sale and its employee stock options are getting stricter as time goes on. Elon doesn't want dilution of stock ownership. That *lead* to, in Elon Musk's words, a Rapid Unscheduled Disassembly. True, but they have something better. SUCKERS that believe in taking the taxpayers for the ride. I for one will not get on that rocket. The launch itself and getting the payload up there was successful, so that's the primary objective dealt with. The secondary objective of landing for reuse, while important, is still secondary at the moment. So B+ for this flight. It should be an A+ for the flight. If it was any other space agency, this would have been an A+ launch. Maybe no bonus score, but I'll reckon they have a massive payload of flight data to analyse and benefit from, so they still come out way ahead. And they will learn from it just as they have in the past. It is those that don't learn from mishaps that will be left behind. I have a feeling that Elon has a bit of BOFH in him. Get it right next time. So great to see all of Elon & The Musketeers' successes, and their humor and determination when things don't quite go to plan. Presumably that actually means adapt them so that any two of them could increase thrust to compensate for a failing third. Personally I'd have thought that, given the nine on there, adding the capability to use another of the "spares" instead might be a simpler fix. I'm not sure how this would work. If 3 are needed to keep it straight and balanced 2 would not do, not during the final landing phase (unless the nozzles could be steered, unlikely due to complexity). I'm curious though if the cost of launching these 3 extra engines, fuel, extra fuel (to launch the contraption), added risk and cost of maintenance/inspection upon landing is really worth the hustle. The "extras" aren't there for the landing but for the launch. On the landing, they're just there for the ride down. 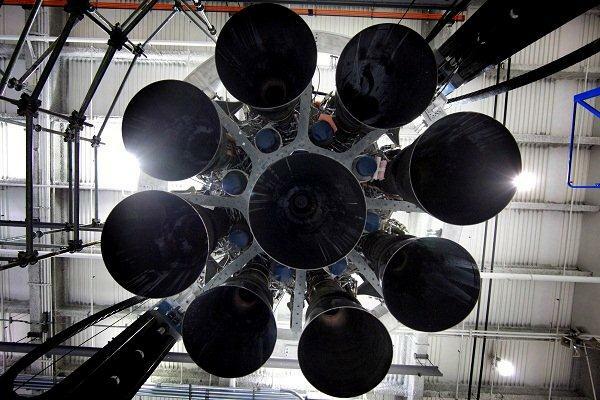 I rather expected Falcon 9 to use gimbaled engines for thrust vectoring. I did not find utterly conclusive evidence with a quick web search. I did find the kestrel engine (Falcon 1 upper stage) used gimbals. As Falcon 9 upper stage has only one Merlin 1D engine, it cannot steer by reducing thrust from the engines on one side. One of the new features of the Merlin 1D is 70%-100% thrust control, so Falcon 9s that flew with Merlin 1C and earlier needed some kind of vectored thrust that could not be done by selecting different power outputs to each engine on stage one. Wikipedia lists some other methods for thrust vectoring. We can rule out some of them because the parts would be visible. Also you can buy a thrust vector control actuator designed for Merlin 1 engines here. I do not know if these parts were selected by SpaceX, or exactly where they would go. Falcon 9 v1.1 first stage has 30% bigger fuel tank than v1.0. The extra capacity is for experimental landing at sea. The extra fuel and liquid oxygen costs about $60,000, and a complete launch costs about $60,000,000. I do not have separate figures for the price of an empty satge 1, the cost of launching it and the cost of sailing it back home. No-one has an accurate figure for the price of testing and preparing a recovered stage 1 for a second flight, but hopefully SpaceX will find out this year. All nine engines on the first stage can gimbal, the centre engine is mounted slightly lower than the outer ones and has a larger range of movement. Steering by differential throttling has been tried by various organisations in the past but is generally too slow for the level of control needed. At the moment only the three engines intended for landing are capable of being restarted in the air, the other six need ground support to light. Adding restart capability to all of them would be possible but heavy. What these booster landings are teaching—rather, reinforcing—is the notion that the future is in re-useable air-breathing booster phase systems. The entire package will take off, as opposed to 'launch', from standard, or minimally modified, civilian and military airports. Going into space will be as commonplace as taking a transatlantic flight. This is a lot harder than it looks. And we're currently short of several technologies to do it. You need to be doing 17,500 mph to get into orbit. That's quite quick. As well as being a long way to go up. And there are various technical challenges to overcome in a working spaceship. Wings are extremely attactive, as they cover the going up bit rather efficiently, and a lot of the weight of the rocket is stupid amounts of rocket fuel needed purely to lift the other stupid amounts of rocket fuel the first few thousand feet. But there's a big problem with wings. Once you're in the upper atmosphere and space they stop doing you any good, and are now just added weight. But even worse, when you try to bring your spaceship back down to earth, they become incredibly dangerous. because now, in order to get down from insanely fast orbital velocities to sensible lower atmosphere aeroplane ones, you have to aerobrake. Using friction with the atmosphere to slow you down. And this is hot. Hence the shuttle being covered in ceramic tiles, which are quite heavy. And if enough break off means you kill everyone. You could of course do more braking in space, but that means carrying the fuel up there, which means less payload, which means you can't do the stuff you went up there for. Going for a lifting-body, rather than wings, might help a lot here though. The Shuttle's wings were apparently an Air Force idea, to do sneaky moves back down from orbits no-one was expecting. The next problem is engines. Jets are great in the lower atmosphere, but even ramjets need air to work. Once you've gone too high for that, you still have to carry your own oxidisers - and you get more whoosh-for-your-weight with rocket fuel than jet fuel. If you have two engines, then that's extra weight to take up there and bring back down - we don't yet have a hybrid engine to do both. Though Reaction Engines are working on something to do this job. But their design only gets a few passegers or a small satellite up there, it doesn't do heavy lift. One thing that helps might be to split the craft. You have a chunky old Jumbo Jet type thing (or Virgin's White Knight) to do the runway take off, carrying the actual spaceship up to 40-50,000 feet. Then releasing it and coming back down to land. That's your superflous jets and big wings. You then only need to design something to start at 500mph at 45,000ft - but that still needs a dirty great rocket strapped on the back, or to have some hybrid air-breathing/rocket engine we've not yet designed. Which is why we're still using rockets. And SpaceX decided to try the hard problem of landing one, rather than the even harder wings/lifting-body thing. Don't forget the landing gear. If you are going to use wings for landing (and it is landing that is the issue here, not launch), then you need some wheels to land on, and you really need to raise them up out of the way to reduce drag during launch and re-entry and lower them again for landing. So that's another system adding weight and complexity. And let's also not forget the primary goal, which for SpaceX is a colony on Mars. Wings and jets and such-like are much less useful on Mars, and the wheels need a smooth landing strip. A rocket landing on its own plume can land on pretty much any solid body in the solar system. A rocket landing on its own plume can land on pretty much any solid body in the solar system. 3 engines good, 2 engines bad.. If it's angled to come down on 3 engines, changing the configuration when almost landed would lead to unbalanced thrust I would have thought, on top of pretty much requiring the central engine to work without fail. That's quite the point of failure. Still not insurmountable with enough white coats. And the biggest tragedy would be not learning anything. Re: 3 engines good, 2 engines bad..
All they need to do is introduce a PAUSE button into the control system. Then just hit that, sort the problems out, get another coffee, and continue with the landing. "There won't be video of the event until staff get aboard the drone landing ship..."
As the article mentions... lack of fuel remaining was a concern. There may have insufficient fuel remaining to allow enough flow to all three engines for proper control. I.E. What if an engine drops thrust because "thar be no fuel thar"? Rapid Unscheduled Disassembly also sounds like the name of a Culture vessel, probably a GCU or Offensive Unit. Re: On a related note . . . I'm thinking Abominator-class offensive unit, because it works both ways: it describes what happens when the ship splits apart into a fleet and what happens to any hostile vessels encountered whilst doing so. the key issue is what does this do to the FH first launch and 1st Dragon to Mars. Since it looks like they will need to divert at least some resources to deal with this. I for one approve of naming existing things after Culture ships, even if the sarcastic AI's may still be some ways off. Re: "Of Course I Still Love You"
Who writes these articles? A grammatical error in the paragraph two and three. Forgot the colon after "Re" - see this response title. How is this a failure? Really, they delivered two satellites into their correct transfer orbits. That sounds like success to me. Nobody else even tries to recover first stage hardware. When SpaceX does it, it's just gravy. Falcon 9 has no redundancy on the landing currently. either the three motors light or its not going to recover. Falcon 9 is single engine out capable on launch only. Not a trivial thing to just turn on another engine it would be asymmetric, so more likely it needs two to be lit in the ring and the center. Sounds like Rule 34 at work.